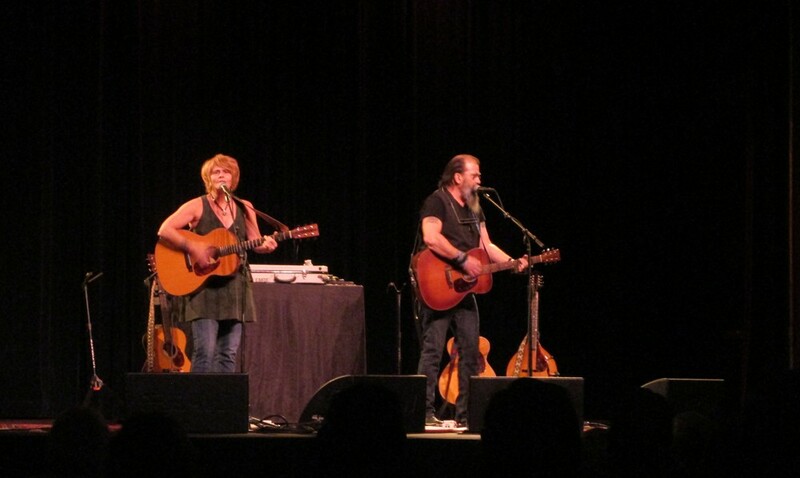 Shawn Colvin and Steve Earle at the Bing Crosby Theater Wednesday. 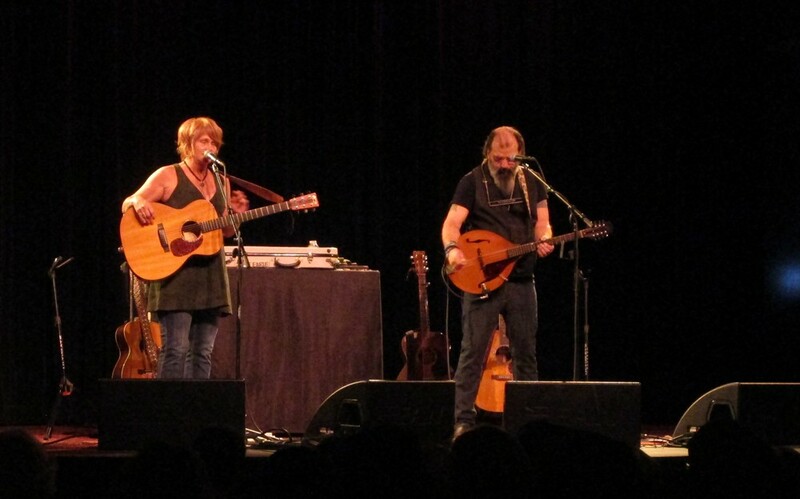 Shawn Colvin and Steve Earle's decision to form a folk duo and record an album under the rather obvious name Colvin & Earle proved inspired once the record arrived in June. Given both artists' long histories as headliners, it's no surprise their show at the Bing Crosby Theater Wednesday lived up to the strength of the album, and then some. The two swapped stories and songs for the better part of two hours, playing the entire Colvin & Earle album and delving into their respective catalogs for old favorites, too. For fans, it was a treat to hear them talk about the songwriting process for the original songs on the new album, and how they decided to cover tunes like the Rolling Stones' "Ruby Tuesday" and Emmylou Harris's "Raise the Dead" — both highlights of the show. For the Stones track, Earle talked about "playing" a tennis racquet to the song in the mirror before he actually learned how to play a guitar; for the Harris song, Colvin talked about Emmylou's often-overlooked songwriting gift. They kicked off the show all business with no chit-chat, starting with a cover not on the album, the Everly Brothers' "Wake Up Little Susie" before launching into the first song the wrote together, the excellent album-opener "Come What May." After that, well, you couldn't really get either of them to shut up between songs, and the show was better for it given both artists' skill at crafting a story and witty one-liners. Colvin introduced her "That Don't Worry Me Now" by talking about being known as a songwriter who writes "a lot of breakup, about death, about regret. People seem to enjoy it," she deadpanned. Earle introduced his song "Someday," one that Colvin's covered in the past, with a long story about his early days in Nashville, struggling to land record deals and make noise in the industry before going to an inspiring Bruce Springsteen concert. The poignant tale was one of the best moments of a show full of great ones. Both singers played mostly acoustic guitar, although Earle occasionally blew a harmonica and swapped his six-string for a bouzouki or a cherished mandolin that he described as "my favorite thing in the world. I was determined this last divorce to get out with at least this f—-ing thing!" As a way to introduce his rambunctious "Galway Girl," the comment on the end of his seventh marriage was hilarious, and the song some in the audience on their feet and dancing. Their voices complemented each other well, the original songs they wrote for the album proved strong enough to stand up next to both artists' older work. Among the best were the gospel-tinged "Tell Moses" that they turned into a sing-along, the stirring "You're Right (I'm Wrong)" and "You Were On My Mind." Among their older tunes, Colvin delivered her biggest hit, "Sunny Came Home," and Earle showcased his anarchist/activist bent with a great version of "Thinking About Burning Walmart Down." The duo encored with a Beatles cover, "Baby's in Black" that Earle introduced as "more hillbilly music from across the pond," as well as Colvin's "Diamond in the Rough" and finally Earle's "Copperhead Road," capping a virtually perfect evening.